Wait, I Thought That Was an Egg! Being a huge foodie myself, I can talk about, write about and eat food 24/7 and I am always open for trying new and “different” types of foods. Having said that it’s no surprise that I chose Heston Blumenthal, one of the top chefs in the field of molecular gastronomy, as the person I would want to go to dinner with. To better explain what molecular gastronomy here is a small question: What do you think is represented in the picture below? Most of you probably thought that this was the regular eggs and bacon you can get at any restaurant, but you are wrong! 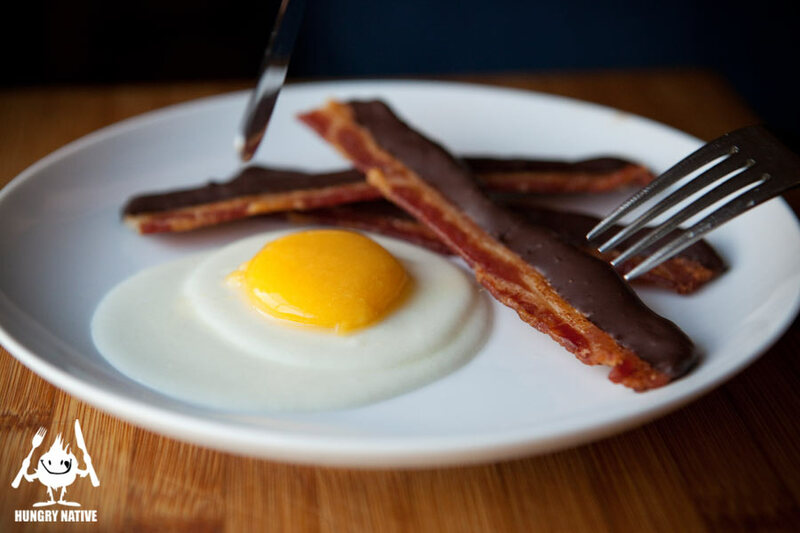 Even though the bacon is real bacon dipped into chocolate, the part that looks like egg yolk is actually is a mango puree and the yolk consists of vanilla yogurt. Molecular gastronomy combines science and food in order to create enhanced sensory experiences for food lovers (Molecular Recipes). Heston Blumenthal is a self-taught, curious chef who seeks to use scientific methods in the kitchen in order to bend or break the traditional rules that surround the kitchen and cooking in general. 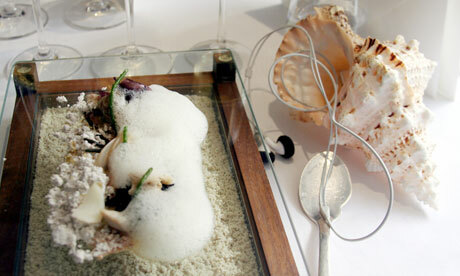 The dish represented below is called the “Sound of the Sea” and it consists of seafood items combined with tapioca that is made to look like sand. There is also an i-Pod tucked into the seashell that plays sounds of crashing waves (CNN). By this unique presentation of food he appeals to a variety of senses and creates an experience. I would want to be his guest at his restaurant, The Fat Duck in Berkshire, England, where the tasting menu costs 220 pounds (equivalent of approximately $300) and consists of food items named Mad Hatters Tea Party, Like a Kid in a Sweet Shop and Bortryts Cinarea (which is the biological name of a fungus). The full tasting menu can be found here : The Fat Duck. The tasting menu also suggest that 4 and a half hours should be allotted to complete the full experience, so I think this would be a good opportunity for me to ask him if he considers himself more like a chef, an artist or a scientist. I can also ask him questions regarding the food industry and get insider information on what is up and coming in the world of gastronomy. Maybe he will even let me in his kitchen and show me different of methods of creating food beauties. I’m sure a man who is very creative and has paved the way to a new way of thinking about food, will have a lot of interesting stories to share, so I would love to eat a meal with him an learn about all his experiences. Great choose! I am also a huge foodie and when I saw this said wow! Though I have never heard of Heston Blumenthal, the field of molecular gastronomy sounds fascinating. Does this change the way individuals view food? Has it changed the restaurant industry? Its interesting that we can now think of food in terms of science and art. I have never heard of Heston Blumenthal before, but after doing some research I found out that he is one of the renown chefs practicing this new technique, so I chose him as my dinner invitee. I think this method plays with your senses a lot, so it changes individuals perception and view of traditional cooking styles, but I doubt that it is going to appeal to masses and become mainstream due to the fact that it is usually served in expensive restaurants with Michelin stars. I, myself, love food and what it brings to individuals’ lives. I am always interested in trying something new that I have never seen before. The question I have is looking at this on a larger scale: How do you think this can/will affect individual families when it comes to food? Also will this affect the type of food made in other countries? There are a lot of different kits you can buy online and you can experiment with, but I think some of the methods require extreme temperatures, so I don’t know if the kits would be useful for families in the house. I think right now industrial kitchens are the best place to perform molecular gastronomy, however with new inventions maybe someday we will see a molecular gastronomy kit in most of the houses. I think this method of cooking can be adapted to the cuisine of any country since you can innovate and put different ingredients in it. I believe that this method can become popular in high-end restaurants in any country. Do you watch Top Chef? Lots of fun foodie action. I have had some pretty pricey tasting menus in Spain at places run by people who worked with Ferran Adria, one of the orginators of highly creative food at El Bulli. THey were great fun and worth the cost. My favorite moment was being presented little sweet cubes that were ridiculously over-explained as an American dessert… marshmallows! Given then high-end treatment, they were different. But it was funny. Another little place in Barcelona has something they call the McFoie, a little foie gras slider on a bun. Cute. (Called Tapas 24). I know that whenever I watch a cooking show I get hungry, and wish that there is an immediate order button where I can order the food being prepared and eat it while watching it. Because this magical order button doesn’t exist, in order to satisfy my hunger I go to the kitchen and grab a snack, so I kind of understand the results of the research study you have mentioned. It is funny that marshmallow was over-explained as an American dessert, I’m curious to know what the treatment on them was that made it so special. Spain is one of the top lists on my places I want to travel to, since I have heard so many good things about its amazing food and tapas culture. It was just a handmade marshmallow…. I only know Catalunya very well. But if you go to Barcelona/Catalunya, I can share my foodie google map. <a href="http://www.carlesabellan.es/restaurantes-tapas-24/"Carles Albellan's Tapas 24 in BCN is one of my favorites. Apparently he is branching out to Montreal too!